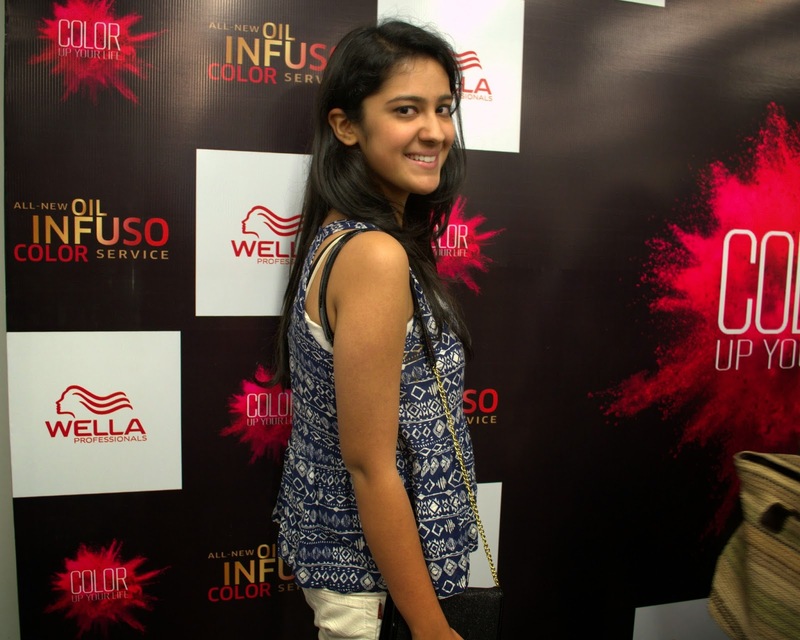 It was that time of the year again when Wella decided to be the host for a bloggers meet. Last year's meet was no doubt astounding but this year's meet was even better. 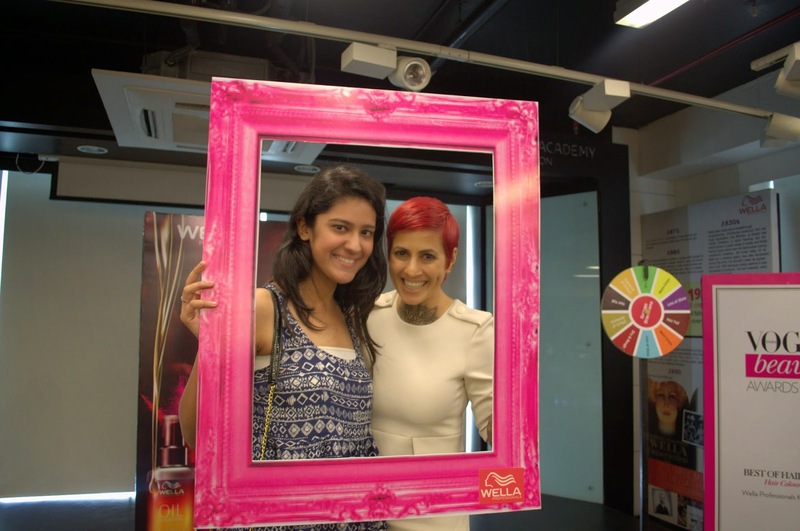 The invited bloggers got the chance to meet the famous hairstylist Sapna Bhavnani and even interact with her. 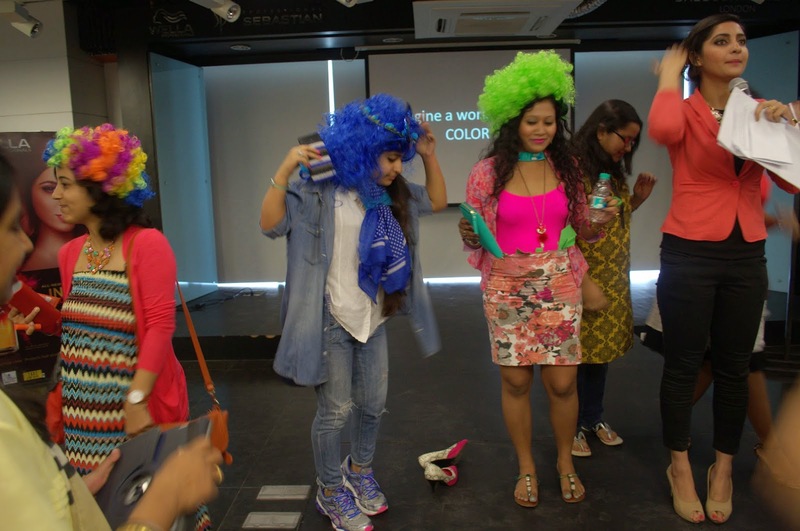 I, along with many other bloggers got enlightened with many facts about hair colouring. The meet began with a brief introduction about Wella and what the meet is about. It continued with fun activities for the bloggers. We had to team up and work together in one of the activities. 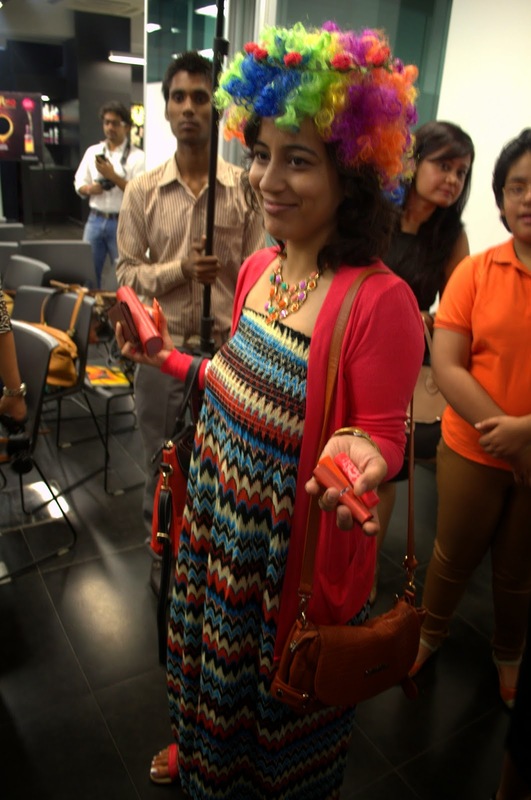 After all the fun activities, Sapna took the spotlight. She charmed us all by humble nature and knowledge about hair coloring. Being a hair stylist and a really experienced one, Sapna told us that all the myths that we Indians believe about hair color are totally wrong. She told us that if you get your hair colored it won't harm your hair. Her theory is that every girl should believe in getting her hair colored because every hair color makes you feel differently. Having done experiments on her own hair since teenage years, Sapna strongly believes that with a new hair color comes a new wardrobe makeover. 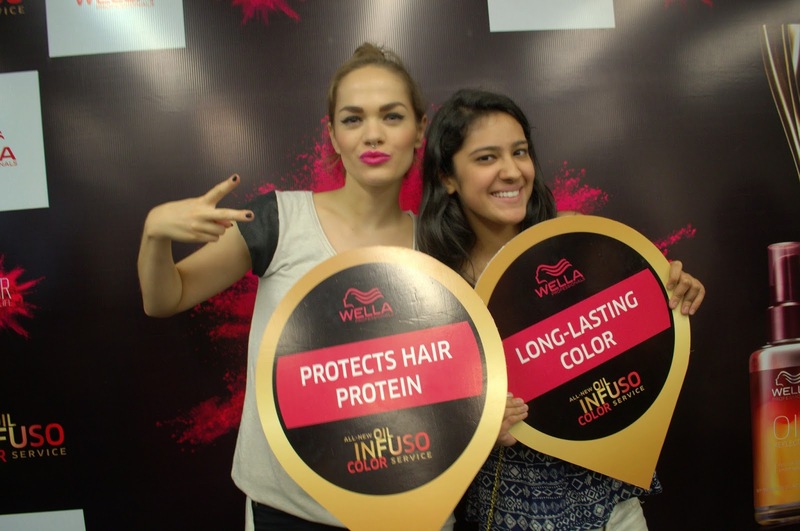 At the meet, we also got familiar with the new Oil Infuso Color Service introduced by Wella. The Oil Infuso bottle provides long lasting color results and takes care of hair health. The oil also nourishes and enhances structure of our hair. The oil contains Vitamin E which works as a protective barrier against damage. It also protects the colored hair from sun effects which can act as a chemical and ruin the colored potion of the hair. This oil gives Wella, color up to 86% more shine. So if you get your hair colored by Wella, you won't face the problem of dry or damage hair. The oil is personally used by Sapna and I could easily see the effects of that tiny bottle on her beautiful red hair. Wella understands the seriousness of hair damage and has introduced this Oil Infuso specially for people who want their hair color to be bold and attractive. The smell is too sweet and enchanting so after applying it on your hair, you'll want to keep smelling your hair. The meet was overall a really knowledgeable and interesting one. 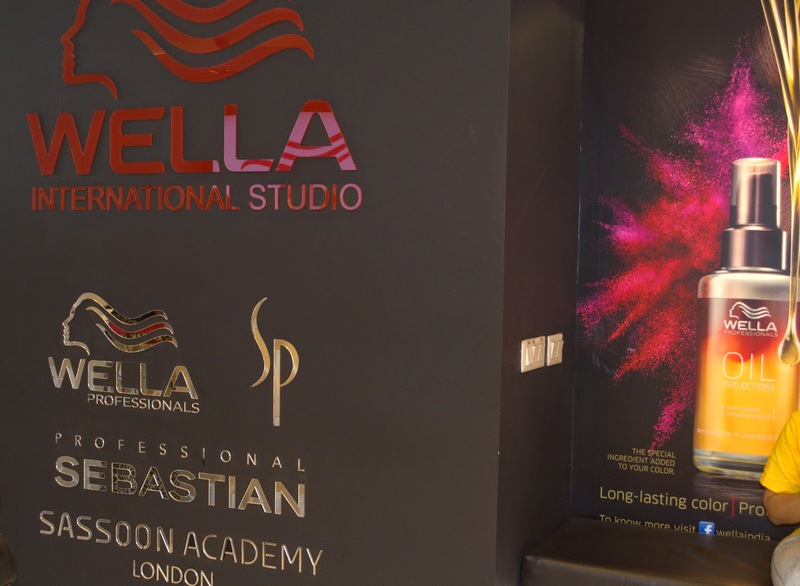 The Wella team was again successful in giving us a satisfactory and enjoyable time. My personal advice to you all readers who wish to get their hair colored is to choose Wella for hair coloring. They will do a fine job. For those of you who are oblivious about the India Runway Week, it is a three day event which introduces young designers and brands. 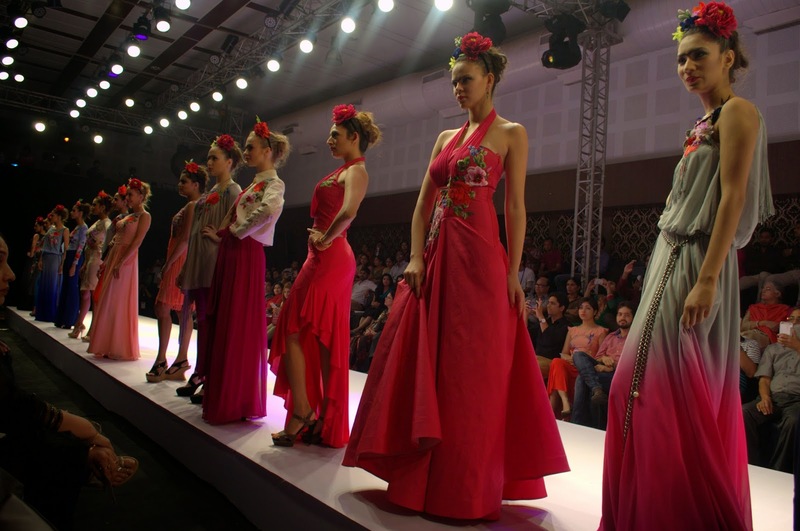 The event highly supports new emerging talents. I got the opportunity to cover the fashion show of the brand W for Women. 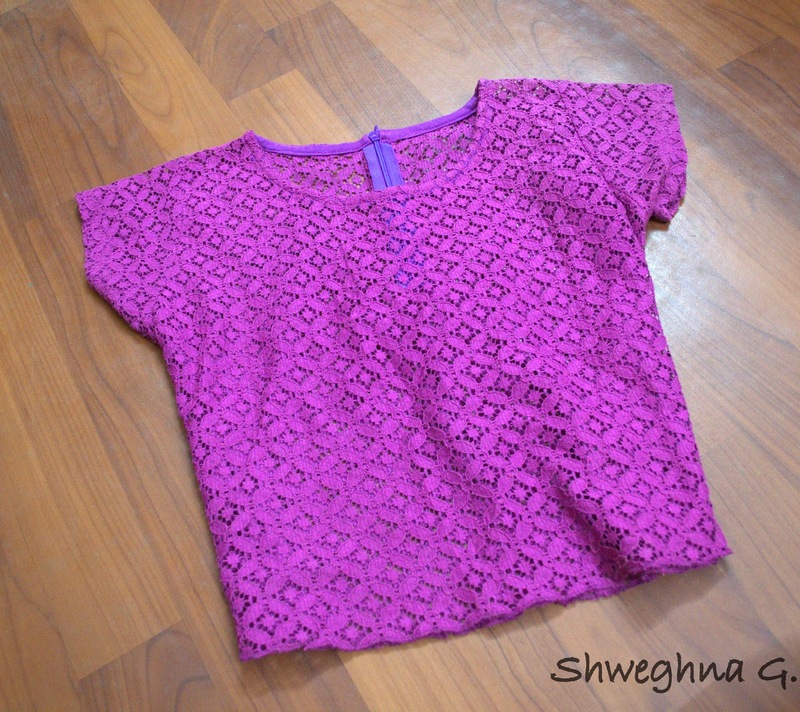 W for Women is one of the leading brands of India and almost every woman buys clothes from here for quotidian wear. The show presented an exquisite and satisfying collection. Not even for a second, could I take my eyes off the ramp. If anyone of you ever dreamed of double drapes in your suits, W made your dream come true. 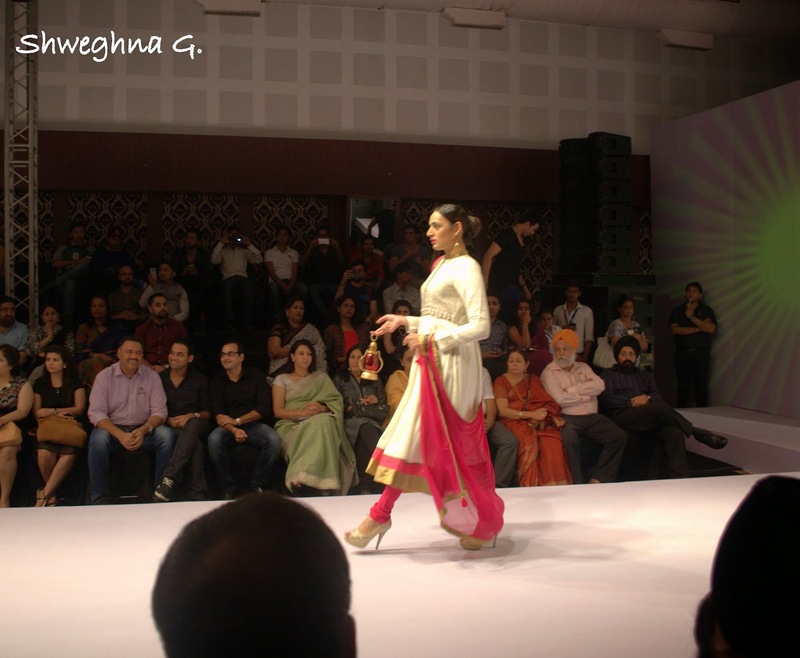 The double drapes gave bit of the anarkali look, yet was different and classy. A total thumbs up for daily wear. Basic anarkalis were girlish and pretty. The cloth material used gave a rich look. 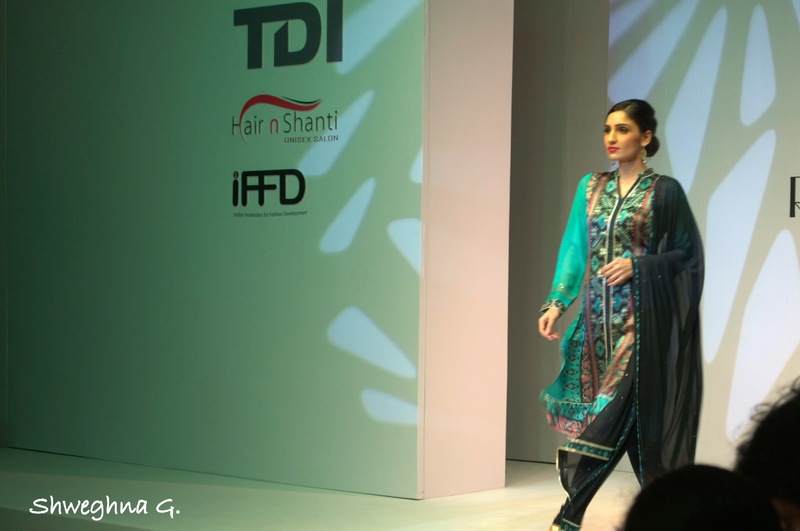 The use of embroidery was done on the neck part which gave a statement to the whole suit. Print work which is a must for suits was not like every other print work you find in the local stores but it was rather elegant and had an edge. Risks were taken with the color combinations. The usual ones were ignored and new combinations were present on the suits. On one side yellow was dazzling and at the other side, purple was glowing in the same suit. The use of Golden color was impressing as it wasn't too shiny nor too dull. It was just a settling golden. My personal favorite were the palazzo suits as they looked really airy and comfortable. The palazzo suits didn't require any drapes to go along them. The colors of the palazzos were breezy and soothing. Some suits had high neck designs along with button work. Many suits also had pattern prints on the sleeves. Some had on the upper half and rest had on the lower half. Sleeve work gave a royal base. Pattern work was also present on the side borders of the suit. This was very diverse as designers mostly focus on the base borders. Not at all disappointing. 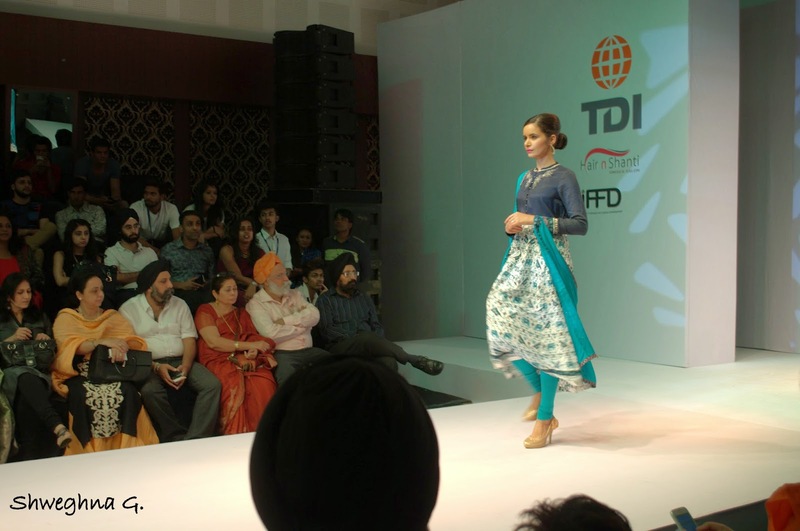 Cropped jackets, abstract prints, neck linings and the designs were the main elements of the show. None of the suits were patiala ones. The designer focused on both style and comfort. 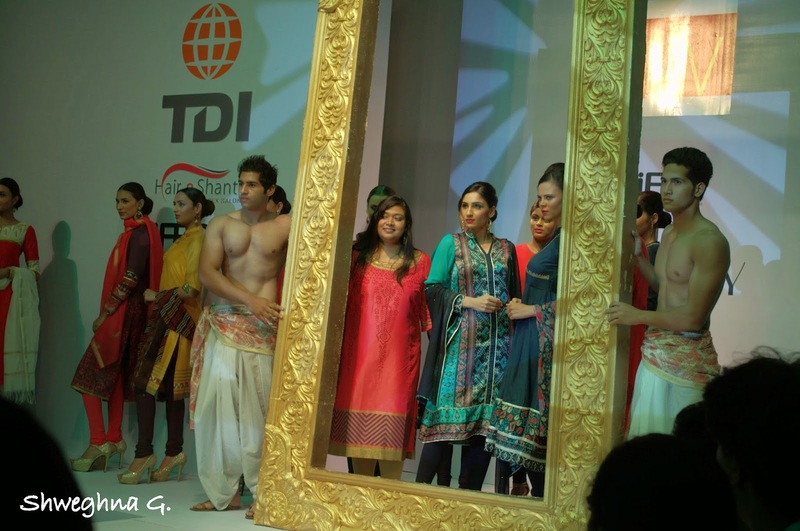 In a nutshell, the show was indulging and a total hit. W broadened their creativity and presented something totally beyond their safe zone. I've been wanting to write a blog post on casual wear since quite a while but didn't get a chance. I've tried to get a bit creative in this one by mixing purple with gold. In the past, I was more of a subtle lover as I used to wear only black with purple. Here's purple and gold! 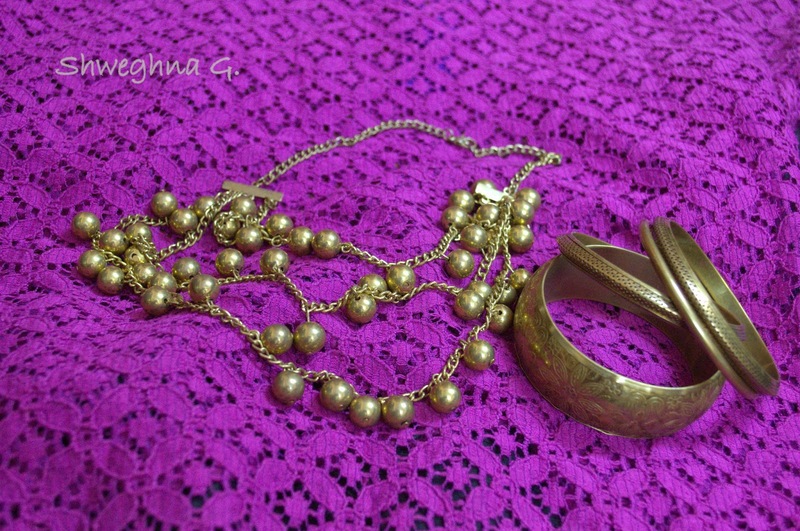 Bangles: Local; Neckpiece: Junk Jewellery. P.S- I've recently started an Instagram handle of my blog: trendy_mannequin. Do follow it for quick blog updates and other fashion related information. 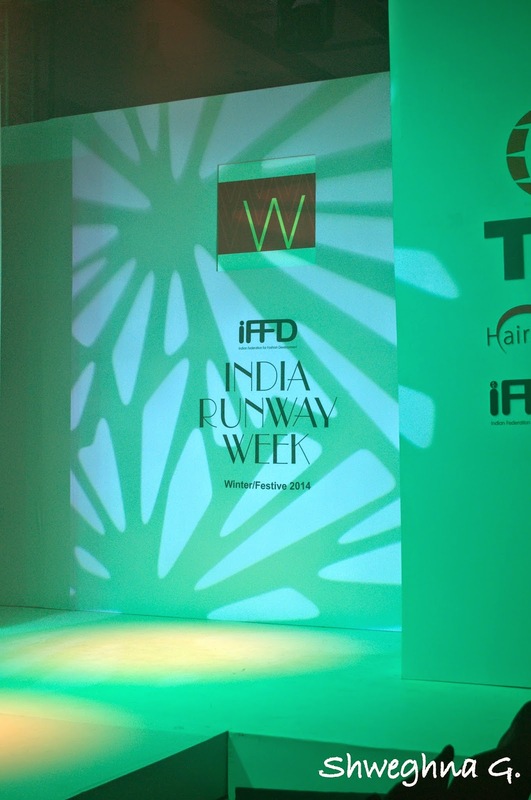 Q&A: Kiran Kheva, Fashion Director, India Runway Week. 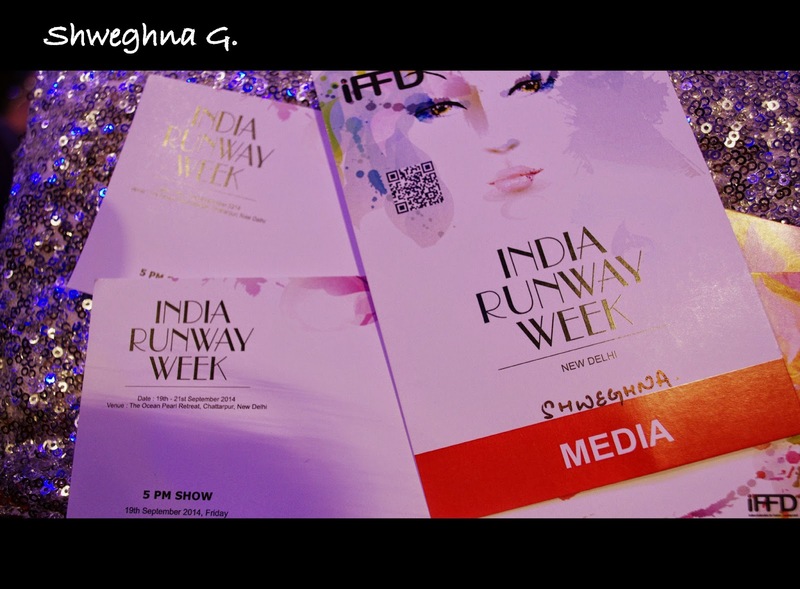 As the India Runway Fashion Week is round the corner, I got a chance to interview the main mastermind behind it. She's smart, thoughtful and full of new visions for the upcoming fashion trends. Q1. What/who was your inspiration? For me, a girl next door, a graduate from LSR with humanities background my inspiration was young designer labels whom we adored in our college days, who were quirky, not so expensive, innovative and made us feel confident but they were not visible in the market, so many aspiring designers and no visibility, no one knew them that very day IFFD decided to launch INDIA RUNWAY WEEK to make these designers known, to provide them a platform where trade and visibility was possible and where they can learn about technicalities of fashion and get grooming. 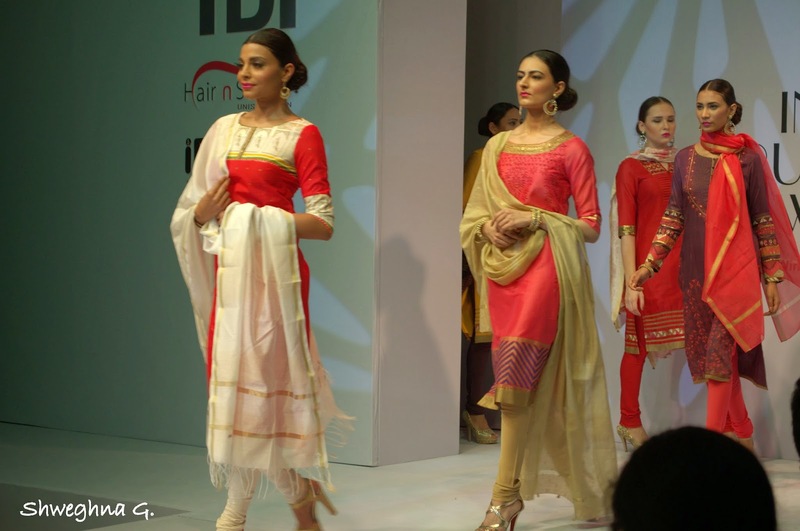 My inspiration is my love for clothes who are the product and hardwork of these designers and IFFD is there to showcase their work through IRW. Q2. When did you know that you had to get into this line? That very day when I learnt that so many designer labels across India were eagerly waiting to showcase their hardwork via a platform, they were ready to learn and expand and just wanted a start to launch themselves. Q3. What struggles have you faced to get to these heights? Each field is a struggle and so is this field, fashion industry in India barely accounts for 0.2% and India Runway Week invites application form all over India for each season, each season is a struggle facing issues from within the industry and outside, so many technicalities to be encountered, each city has so many budding designers waiting to show their worth, we have to shortlist them, groom them, invite buyers for them, media for them (certain times media is not ready to cover new designers), all this demands a lot of hardwork and since our brand is new and has young dynamic team we make it a point to go through all the processes and do a research to launch these designers so its all about struggle and hardwork but because IRW and IFFD is our passion we are happy to put efforts. Q4. Your favorite decade of fashion is? My personal favourite decade of fashion would be 60s as this was an era of rise of feminism and women all over the world were seen getting independent, adopting fashion, making fashion statements (subtle, vintage, melange, polkas).. Certain hairstyles were seen in this era, be it short and trendy, long and confident (kimomo, palazzos or pencil skirts) all were making a mark and even today in 2014 those trends are getting back and are being adopted by women. For me, I have set pretty high standards for a huge break and I am still working on it as at mere age of 24 I see huge break a little far- when India Runway week will have designers from across the globe and each designer living their dream through it. India Fashion Summit was a sort of first huge turning point that showed me a way for huge break, India Fashion summit (platform for recognition of fashion and lifestyle industry) witnessed a great response, we started with 4 designers and today we have 35 designers on board. Q6. Your idea of a great fashion industry is? 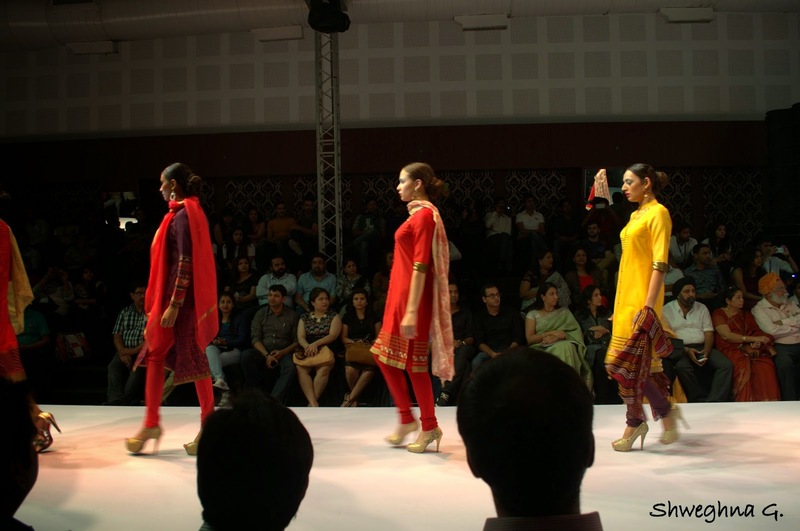 My Idea of great fashion Industry "Indian Fashion industry" is that Indian fashion to be known across the globe, Indian designers to set standards across the continents. In this industry we can achieve growth in terms of business, PR etc only through appreciating our designers, platforms than only it can be a great industry. Q7. Have you ever wanted to step out of this profession? No, I don't think so I would ever want to step out of this profession as Via India Runway Week which is India Federation for fashion development's platform I see fashion statements being made, styles being invented, young minds like me living their dream and with each season , when i see each show entering its climax and these young designers walking the finale round, I see how their dreams come true and that each show, each season everytime my dream comes true, i see India Runway Week as a huge platform who will keep making benchmarks in the fashion industry and make the designers, designs, clothes bigger and known and I will keep working day and night forever. 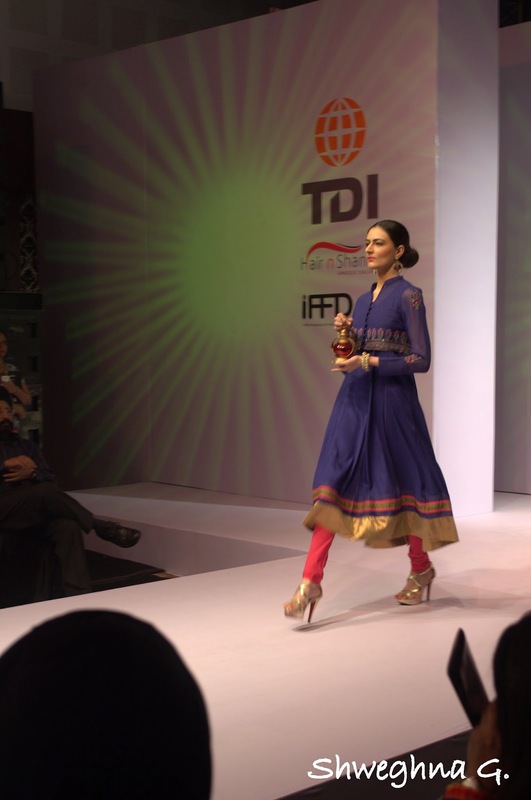 "I am living my dream each day in this world of fashion" through IRW. Q8. One fashion tip for every girl out there. One fashion tip to always keep in mind according to me is wear clothes in which you are comfortable and that make you feel confident, confidence makes fashion statements. "Everyday is fashion Show and the world is your Runway"